What Careers Are Available At Airports? Discover out what type of jobs are found in the airport. Airports across the United States and the world employ thousands of people. These employees range from those with no degree to those with advanced degrees. With so many people needed to keep an airport running smoothly, there are many career paths that can be found, regardless of your level of education or skill set. Air traffic control is one of the many career paths in an airport. Hired and trained by the federal government, more specifically the Federal Aviation Administration (FAA), air traffic controllers track, guide, and control both the takeoff and landing of airplanes, as well as the air traffic above and in the general vicinity of the airport. Air traffic controllers can make anywhere from $37,000 to $149,000 a year, depending on market and experience. Airport security is one of the most important jobs in an airport. It is the job of airport security to protect passengers from harm. Their duties include working X-ray scanners and metal detectors, checking identification, and following up on any suspicious baggage or activity in the airport. Security officers are on the low-end of the salary range, often making only part-time money or an annual salary of $18,500 to $39,000. Security specialists can make as much as $66,000, customs agents cap out at an average of $54,000 and sky marshals can make up to $65,000 a year. Sky caps are similar to a concierge at a hotel. It is the skycap's job to help travelers load and unload their luggage, as well as give directions to the appropriate check-in areas. Some sky caps may also work in security by testing baggage for explosive residue before taking the baggage to be processed by the airline. Sky caps generally make a lower annual salary, around $25,000 a year, but also commonly earn tips. Many careers at airports are provided directly through the airlines that call the airport home. These jobs include flight attendants, pilots and gate and counter ticket personnel. Flight attendants make an average of $45,000 a year, while more experienced pilots at a major airline can earn up to $250,000. Regional airlines might pay pilots as little as $15,000 for part-time routes or $60,000 for a full-time job. Baggage handlers are another career choice at airports across the world. It is the duty of the baggage handlers to ensure that all bags get from the departure city to the arrival city by taking baggage on and off the planes and transporting them to their specific destinations. 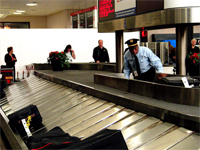 Baggage handlers can make up to $31,000 a year. Line job employees work specifically for Fixed Base Operations (FBO). FBO is responsible for just about everything that occurs on the runways. Duties include guiding planes, fueling planes and securing planes. They may also include fixing planes, maintaining planes and performing plane safety inspections. Line jobs typically earn an hourly wage averaging $15/hour. Custodial careers in airports revolve around keeping both the airport and airplanes clean. Custodians are assigned specific areas and duties within airports to clean bathrooms, vacuum floors, empty garbage cans,and perform other tasks that revolve around keeping the airport clean. The average salary is about $27,500. Since layovers are common, food service is a very wide-open field for airport employment. These jobs range from full-scale sit-down restaurants to small food stands. Jobs are available ranging from busing to restaurant management. On the low end, food preparer's can make $9/hour, but operations supervisors with a related college degree can earn up to $90,000 a year.